Lovely customer chosen colours! 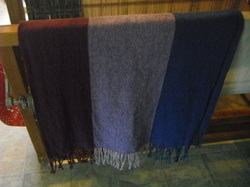 Lighter shawl in Garnet, Lilac and Cobalt with Violet weft. Very dramatic. Sold!